The dolphin was found last week. Marine Animal Rescue said a veterinarian told the group it died of a gunshot wound. A $5,000 reward was being offered for information that leads to the conviction of the person who shot the dolphin. 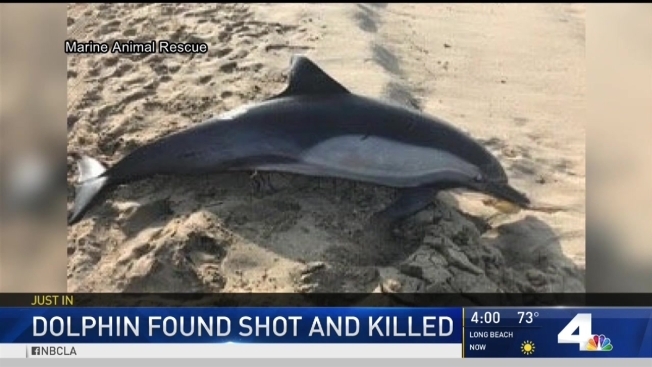 A nonprofit rescue organization was offering a $5,000 reward Friday for information leading to the person who fatally shot a dolphin that was found washed up on Manhattan Beach. Marine Animal Rescue said the dolphin was found last week. When it was recovered, rescue officials discovered that the dolphin had died from a gunshot wound. "There is NO excuse for such brutality against these beautiful animals,'' according to a statement posted on the organization's Facebook page. The group is offering a $5,000 reward for information that leads to the conviction of the person who shot the dolphin. The group can be reached at (800) 399-4253 or (310) 455-2729.